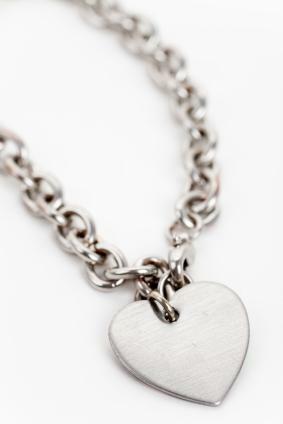 One of the most recognizable pieces of jewelry is the Tiffany Heart Tag Choker Necklace. This classic piece is coveted by many and remains the most popular necklace in the Tiffany collection. Tiffany & Co. has long been one of the most notable jewelers around the world. A purchase from Tiffany & Co. comes in the signature blue box with a white bow. There have been many popular pieces made by this jeweler over the years, but the"Return to Tiffany" collection stands out as one of the most popular. You'll see this message on pieces from key chains to bracelets and on pendants and lockets. New Tiffany jewelry products, popular with many celebrities, quickly become part of the latest trend for the season. If you are looking for a meaningful gift for that someone special in your life, consider the signature Tiffany Heart Tag Choker. It is made of sterling silver and is engraved with the popular Tiffany motif: "Return to Tiffany & Co. New York." The meaning behind the message is that one is never lost. The Tiffany Heart Tag Choker Necklace is 15.5'' long and can be engraved either by hand or by machine to make it personal. The choker costs about $320 and can be purchased at any Tiffany & Co. store or on the official website. The front of the tag is always left blank unless you choose to have it personalized. The shape of the heart is round, and there is never a curve to it. Tiffany uses sterling silver and the marking "925" to indicate the quality. If the choker is discounted or sold at a price that seems to good to be true, then most likely it is a fake. eBay has a wide selection of Tiffany-inspired necklaces. Many claim to be authentic, but most are replicas. Be sure to buy from a reputable seller so that you can sure that you are getting a realistic looking piece. Another sites that has a great selection of Heart Tag necklaces is Eve's Addiction. The Tiffany-inspired choker costs under $30 and can be engraved. Return to Tiffany Bead Necklace is crafted in sterling silver. It has a small heart tag that hangs from a 16" long sterling silver beaded necklace. Mini Heart Tags Drop Necklace has the popular "Return to Tiffany" inscription and features mini heart tags dropping from a sterling silver necklace. Heart Tag Charm and Chain has a unique charm with the inscription done in blue enamel. The chain and charm are sold separately. Return to Tiffany Heart Lock Charm opens and closes and makes a special gift. The inscription is created in blue enamel and is set in sterling silver. The charm and chain come separately. Extra Large Heart Tag Pendant is an attention-getting piece. The extra large pendant comes on a 34" sterling silver chain. Most of the pieces from the Tiffany hearts collection can be found as replica versions as well. If there is a certain piece you are interested in but can't justify the price, consider an inspired item that can give you the same look and style. For example, Skye Sterling sells Tiffany inspired heart cut-out earrings for under $20 that are designed to look like the authentic piece. The site also carries heart charm pendants and lockets that will look much like the ones designed by Tiffany. To compliment your necklace, consider a matching heart bracelet or a pair of heart-shaped earrings. Heart jewelry is not only fun to wear but can hold a special meaning to the wearer as well as the one who gave the piece. Heart necklaces can be worn with anything from jeans and a tee to a fancy dress. Wear a heart design anytime you want to hold something close to your heart and feel love.